This week, we had the chance to talk to Nigel about his modeling and hosting journey! Hey Nigel! Tell our readers more about yourself. Salutations! The name’s Nigel Chin. I’m an aspiring full-time host, emcee, commercial talent and model. I took my first step in the entertainment industry from a modelling competition. I work full time under Evenstar Management, a talent boutique agency as a host. I am also engaged for various side-jobs such as modeling, commercials, social media postings and etc. Modeling as a profession has never been a thought to me until I got accepted into a modelling competition called Asia New Star when I submitted a tagged photo of me and a friend of mine (except I cropped his face out). From there, I was even astonished when I made it to the finals. From there I guess the ball continued rolling till who I am today. When did you first discover your passion for modeling? As much as I’d like to model, my primary interest is to host as I can be quite the chatterbox. I do enjoy watching travel, food & cultural shows ever since in my early teens and I do look up to Henry Golding and Ryan Seacrest. However, the community and my friends seem to think modeling suits me better and that’s how I wound up modeling. As a model, its crucial to have great skin. What’re your tips for that? The imperative things such as being stress-free, have sufficient sleep, stay hydrated and avoid heaty food like nuts. Give us a glimpse of the modeling industry. With how modern our world is today, you could even photoshop with the apps in your smartphones. Just like in the fashion world, not everyone you meet may be as trustworthy and helpful as you think. But its experiences like these which will either make you or break you, it’s basically the real world where ever you work. Any fun & upcoming projects for you? Oh yes definitely, and I’m always looking forward to work. This time round, I’m more ecstatic to have work settled before I go on a little va-cay-cay to Seoul! My social media handle is @nigelust and though I may not have a YouTube account (yet), I am indeed on a few YouTube videos already. 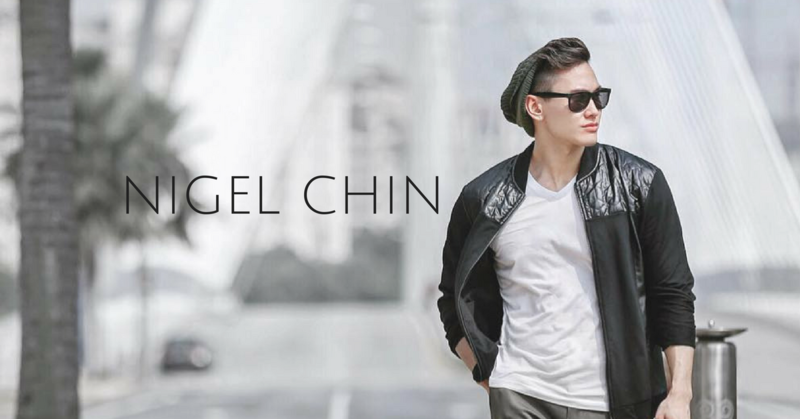 Just hit “Nigel Chin” and you’re bound to find a few covered by renown Malaysian YouTubers such as JinnyBoyTV & Dan Khoo productions! As my job can be unpredictable, my day-to-day basis has no fix. It ranges from being preoccupied with work at the studio to events or perhaps at the gym to maintain my fitness. Hence, I do value my space whenever I get the opportunity. In terms of interests, I do take my fitness regime seriously as I have this compulsive feeling of guilt if I ever not work out on days that I should. In terms of profession, I am passionate to be the voice of Malaysia someday to make Malaysia more recognizable whether or not my job paves the pathway there. Besides, it’ll do good to make your country proud. As mentioned in question 4. Yes, my top idol is Ryan Seacrest but I do look up to Henry Golding as well. They’re the reason why I aspire to be a great host someday myself. Everyone has their destinations and there’s always going to be cars that are ahead of you but its not about the destination, it’s the journey! Though it may sound cliché, I will have to go with my mother. When she could say no, she will always strive to make it a yes instead. Whether it may be asking her for a favour or help or even whether there’ll be dinner. She works really hard and tries to make everyone’s life easier to the point where sometimes she forgets about hers. Spending a nice sunny day at the beach soaking up the sun and enjoying the ocean waves and breeze. Sounds heavenly! Friends. At a point in the time I tend to forget what really makes me happy until I was alone. And that’s when I realize my friends are always there when I was in need. Having crazy and silly friends also makes me forget my problems as they never fail to crack me up. I see myself having my own show and cross-fingers I land a hosting gig which allows me to cover on travel, food and/or culture. Check out Nigel’s Facebook & Instagram!